nv Sean Thackrey, Pleiades XXIV Old Vines, Red Table Wine, California. Sean Thackrey’s old vine Pleiades is now on the 24th edition and it still as intriguing and beguiling as ever, this is truly a California inspired icon and should be celebrated for it’s success and rule breaking uniqueness, a non-vintage kitchen sink blend that is both serious and fun. The blend is as unusual as it gets with all old vine hillside grapes that include Sangiovese, Zinfandel, Viognier, Pinot Noir and Mourvedre that mostly come from Sonoma County, though I think Mendocino and Marin play parts too in this savvy and sappy red. The latest release XXIV is a bit richer and deeper, bucking the recent trend going to the lighter style, it shows more to it’s original roots with black cherry, plum, balsamic dipped strawberry, tangy currant, menthol, sweet herbs, cola, dusty spice and raspberry liqueur. 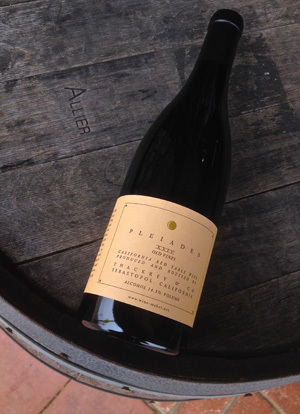 The Pleiades XXIV is a medium full red that comes in at 14.5%, still feels vibrant, silky and textural in the mouth without heat or heaviness and it plays well with almost any cuisine, drink over the next few years. This is a wine that will certainly appeal to Thackrey’s legion of fans and can attract a whole new adventurous crop as well, very interesting and distinctly singular in style.